With the high street seemingly dying out, it’s more important than ever to futureproof your business. Big names such as Toys R Us, BHS and Maplin have all gone into administration within the last two years, proving that no one is safe from the ever-changing economy nowadays. However, there are ways to ensure success and make sure your business is ready for the future. 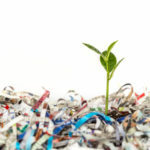 Here are five of the greenest ways to futureproof your business. If your business isn’t using renewable energy sources yet, you need to start investing as soon as possible. While not every business is going to be able to afford a wind turbine to keep it running, there are plenty of other options to consider. Could you utilise solar panels on your office or warehouse roof? Even the smallest changes, such as using rechargeable batteries, can make a big difference. Renewable energy will save your business money, reduce its carbon footprint, and ensure your business is ready for the future. Do your employees know how to be eco-conscious in the workplace? If they are constantly leaving lights on, throwing away things that can be recycled, or wasting water, then perhaps it’s time for some green initiatives. Promote your eco-friendly principals in employee manuals and offer incentives for the greenest employees. You may also want to consider a ride to work or car sharing scheme, offering benefits to those who don’t drive to work. Not only will an eco-friendly business save you money, but these kind of schemes can improve employee morale and productivity. Are you stuck in your local bubble right now? Is there any way you can make your business more international? Widening your audience is an excellent way to ensure future success for your company, especially when the economy in the UK is being hit hard. As long as you consider responsible travel on your business trips, this is an ideal way to futureproof your business and grow at an exponential rate. If you are still using paper in your office, then it’s time to stop. What are you printing out that cannot be saved digitally? Utilising cloud storage systems, such as Google Drive, will keep everything you need in one place without having to spend out on paper and printer ink. Expanding internationally will also help you cut down on paper, as most communication will be via email or Skype. Say goodbye to paper and become a paperless office! There are so many green initiatives and grants available nowadays that all encourage your business to become more eco-friendly. Many can help you with energy efficiency in your work place and the Carbon Trust have a Green Business Fund available to both small and medium sized businesses. Many of the points we have covered will help you on your way to a business grant for green initiatives; meaning you’ll be able to save money and make money all at once. Of course, any extra income is key to ensuring business success. These are just some of the many ways you can futureproof your business and ensure long-term success. Not only will you be helping your own business, but you’ll be doing your bit for the planet on top. It’s a win-win situation! Do you have any other green ways to futureproof your business? Let us know your top tips.